in the annals of crime was conducted at the Royal London Hospital. Three British pathologists, covered from head to toe in white protective suits, stood around a radioactive corpse that had been sealed in plastic for nearly a week. The victim was Alexander Litvinenko, a 44-year-old ex-KGB officer who had defected from Russia to England in November 2000 and had drawn on his experience to denounce the government of the newly installed President Putin. What the pathologists found is still a state secret. before his death from radiation poisoning. The mysterious circumstances surrounding the death of Litvinenko, apparently from radiation poisoning, spawned an international crisis. Britain demanded that Russia extradite a Russian citizen allegedly connected to the case. When it refused, Britain expelled four Russian diplomats from London, in reprisals reminiscent of the Cold War. The British authorities had told the press, "We are 100 percent sure who administered the poison, where and how," but they refused to disclose their evidence. Nonetheless, the consensus that the Russian secret service was behind the poisoning was so powerful that a Washington Post editorial could assert that the poison "dose was almost certainly carried by one or both of the former Russian security operatives — one of them also a KGB alumnus — whom Mr. Litvinenko met at a London hotel Nov. 1." To find out what evidence the British had actually provided to the Russians to back up their extradition request, I went to Moscow to meet with the Russian prosecutors in charge of the case. My investigation made it clear that far more was involved than the killing of an innocent dissident. Before Vladimir Putin took over the Kremlin in 2000, Russia's most powerful oligarch had probably been Boris Berezovsky. He controlled the country's largest television channel and a large part of the private economy, and served as deputy secretary of Russia's National Security Council. He also had his own protector in Litvinenko, the deputy head of the organized crime unit of the KGB's successor, the Federal Security Service, or FSB. But even Litvinenko could not help Mr. Berezovsky when Mr. Putin turned on him and had him investigated for massive fraud. In late 1999, Mr. Berezovsky fled to Britain, followed by Litvinenko a year later. In London, Mr. Berezovsky had an extraordinary agenda, which he himself described as overthrowing the regime of his archenemy, Mr. Putin. Litvinenko, whom Mr. Berezovsky now supported through his foundation, took a key role in this ambitious enterprise. He wrote books accusing Mr. Putin's FSB of everything from collaborating with the leadership of al-Qaeda to framing Chechen rebels for bloody acts of terrorism that FSB agents themselves committed, such as the bombing of six apartment houses in which over 300 people died. In addition, Litvinenko also had less visible employment as a consult for two closely connected security companies housed in Berezovsky's office building at 25 Grosvenor Square. Litvinenko's day of reckoning came on November 1, 2006. First he had lunch at Itsu, a trendy sushi restaurant in Piccadilly, with an Italian associate, Mario Scaramella. Mr. Scaramella, who had flown in from Naples the night before, had been involved with Litvinenko in, among other things, a Byzantine plot to penetrate the operations of a suspected trafficker in prostitutes, arms, and enriched uranium. At that lunch, Mr. Scaramella gave Litvinenko some documents. During his stay at the hospital, Litvinenko's condition continually worsened. The initial diagnosis was that he had been poisoned by Thallium, a non-radioactive toxin used in Russian rat poison. Since the KGB had reportedly used Thallium as a poison in the Cold War era, the theory gained traction in the press that Litvinenko might have been the victim of the FSB. As Litvinenko had been denouncing the FSB for six years, it seemed at least plausible that the FSB had sought revenge on him. At the hospital, Mr. Berezovsky's PR consultant, Lord Tim Bell, began briefing journalists, arranging interviews, and supplying photographs of an emaciated, hairless Litvinenko. Meanwhile, Litvinenko was moved to University College Hospital and given massive doses of the cyanide-based antidote for Thallium, which did not work. As Litvinenko's condition grew critical, Alex Goldfarb, the executive director of Mr. Berezovsky's foundation, prepared for Litvinenko's end by writing out his "deathbed" statement, which, according to Mr. Goldfarb, was drawn from statements Litvinenko had dictated to him. A few hours after Litvinenko died on November 23, 2006, Mr. Goldfarb arranged a press conference and released the sensational deathbed statement accusing Mr. Putin of the poisoning. Giving further weight to this theory, British authorities switched the alleged crime scene from the Itsu restaurant, where Litvinenko had met the Italian Mr. Scaramella, to the Pine Bar, where he had met the Russian Mr. Lugovoi. Just two hours before Litvinenko died, an unscripted surprise developed in the story: The hospital discovered that he had not been poisoned with Thallium. Instead, lab tests showed that he had in his body one of the world's rarest and most tightly controlled radioactive isotopes, Polonium-210. Polonium-210 is of great interest to the UN's nuclear proliferation watchdogs because it is a critical component in early-stage nuclear bombs. Both America and Russia used it as part of the trigger in their early bombs. So did most, if not all, countries with clandestine nuclear programs, including Israel, India, Pakistan, South Africa, and North Korea. To be sure, some of these nuclear powers shifted to more sophisticated triggers after they tested their weapons. Even so, as a declassified Los Alamos document notes, the detection of Polonium-210 remains "a key indication of a nuclear weapons program in its early stages." So when Polonium-210 was detected in Iraq in 1991, Iran in 2004, and North Korea in October 2006, the concern was that these countries might be trying to build a nuclear weapon. When Polonium-210 was discovered in London in late November 2006 in Litvinenko's body, however, no such proliferation alarm bells went off. Instead, the police assumed that this component of early-stage nuclear bombs had been smuggled into London solely to commit a murder. It would be as if a suitcase nuclear bomb had been found next to an irradiated corpse in London, and everyone assumed the bomb had been smuggled into the country solely to murder that person. Michael Specter, in the New Yorker, for example, called it the "first known case of nuclear terrorism perpetrated against an individual." But why would anyone use a nuclear weapon to kill an individual, when a knife, bullet, or conventional poison would do the trick more quickly, efficiently, and certainly? Certainly Polonium-210 is lethal once it gets into the blood stream. Before Litvinenko's death, six people died of exposure to Polonium-210 — two in a radiation lab in France, three in a nuclear facility in Israel, and one in a nuclear research lab in Russia. All resulted from accidental leakage of Polonium-210. Because it is unstable, turning into a gas at 55 degrees Celsius, it is extremely difficult to handle. It is also expensive. A scientist by training, Mr. Goldfarb authoritatively asserted in his book "Death of a Dissident," written with Marina Litvinenko, that "97% of the known production of Polonium ... takes place in Russia." Since little else had been written about this rare isotope, many commentators assumed it was an established fact. An article in the New Yorker noted, "Nearly all of it [Polonium-210] is produced in Russia." To make such a determination, it is necessary to know both how much Polonium-210 is produced in Russia and how much is produced in other countries. Yet, as Polonium-210 production is a closely guarded secret, neither quantity is known. In 2006, neither Russia nor any other country in the world admitted manufacturing any Polonium-210 at all. Russia's nuclear authority claims that the sole reactor that had been manufacturing its Polonium-210 had been shut down in 2004, and the small quantity exported to America in 2005 and 2006 — approximately 3 ounces each year — came out of its stockpile. No doubt Russia could secretly manufacture Polonium-210, a process that first requires radiating the metal Bismuth in a nuclear reactor and then extracting from it the Polonium-210. But so could America, Britain, China, France, India, Israel, Pakistan, Taiwan, North Korea, or any other country whose nuclear reactors have not been inspected by the International Atomic Energy Agency, the UN's watchdog for Polonium production. When I asked an IAEA scientist about who had produced any Polonium-210 in 2006, he said, "We simply don't know." He added that North Korea might have produced large quantities, "kilograms not grams," at its Yongbyon reactor for its nuclear tests in October 2006, but the actual amount is uncertain. The Polonium-210 found in London could also have come from stockpiles in many countries, including America. According to the IAEA's Illicit Trafficking Data Base, there had been 14 incidents of missing industrial Polonium-210 since 2004. The minute amount found in London — possibly no more than one-millionth of an ounce — could have come from many sources, ranging from the American industrial supply and stockpiles in Russia to the remnants of the A.Q. Khan network in Pakistan and the North Korean surplus. So news reports, such as the one in the Washington Post that "Polonium is produced and held almost exclusively in Russia," are at best speculation. The British prosecutors aided the flight from reality by filing an extradition request in July 2007. Not only was there no extradition treaty between Britain and Russia, but Article 61 of the Russian Constitution prohibited the extradition from Russia of any of its citizens. Further inflaming matters, Sir Tony Brenton, the British Ambassador to Moscow, suggested that the Putin government should disregard the Russian constitution and "work with us creatively to find a way around this impediment," since British authorities had "cooperated closely and at length with the Russian Prosecutor General's Office." After Russia rejected the extradition request, Ambassador Brenton objected that its decision was not made "on the basis of the evidence," which implied that Britain had furnished Russia with compelling evidence to back up its request. Then Britain expelled four members of the Russian embassy in London, effectively holding the Russian government responsible for Litvinenko's death, and began an international imbroglio. The suspect named in the extradition request is Andrei Lugovoi, who, according to the British, poisoned Litvinenko's tea in the Pine Bar when they met on November 1, 2006. Mr. Lugovoi admitted to meeting with Litvinenko to discuss a business venture with him, but denied having anything to do with his death. Mr. Lugovoi also had been contaminated by Polonium-210, but so was almost everyone else who had come in contact with Litvinenko around that time. Since Ambassador Brenton had suggested that the incriminating parts of the case had been given to the Russian authorities to back up the extradition request, I went to Moscow to find out about more about that evidence. The Kremlin is not known to be forthcoming with secret documents, but, in this instance, I was asking to see British, not Russian secrets. Even so, obtaining access to them was not easy. By the time I arrived in Moscow in late November 2007, the Russian Prosecutor General had consigned this (as well as other high-profile investigations) to a new unit called the National Investigative Committee. It was headed by Alexander Bastrykin, a former law professor and a deputy attorney general from St. Petersburg, who was just assembling his staff in a non-descript but well-guarded building across the street from Moscow's elite Higher Technical University in the district of Lefortovo. Before I could meet officials in a conference room there to review the British file, my resourceful research associate in Moscow had spent many weeks sending the necessary documents to Mr. Bastrykin and his staff. There were other bureaucratic requisites, such as my agreeing to indemnify the Russian government for any costs that resulted from disclosing the British evidence, submitting my proposed questions, and agreeing not to identify by name any of the officials working for the Committee and refer to them collectively as the "Russian investigators." Then I was told, "The media often reproach the Russian side for its unwillingness to cooperate with the British side, when in reality the situation is reverse." As if to demonstrate this point, the Russian investigators provided me with access to the British files. Like Sherlock Holmes's clue of the dog that didn't bark, this omission was illuminating in itself. After all, Britain and Russia had embarked on a joint investigation of the Litvinenko case, which, as far the Russians were concerned, involved the Polonium-210 contamination of the Russian citizens who had contact with Litvinenko. They needed to determine when, how, and under what circumstances Litvinenko had been exposed to the radioactive nuclear component. The "when" question required access to the toxicology analysis, which usually is part of the autopsy report. There had already been a leak to a British newspaper that toxicologists had found two separate "spikes" of Polonium-210 in Litvinenko's body, which would indicate that he had been exposed at two different times to Polonium-210. Such a multiple exposure could mean that Litvinenko was in contact with the Polonium-210 days, or even weeks, before he fatally ingested it. To answer the "how" question, they wanted to see the postmortem slides of Litvinenko's lungs, digestive track, and body, which also are part of the autopsy report. These photos could show if Litvinenko had inhaled, swallowed, or gotten the Polonium-210 into the blood stream through an open cut. The Russian investigators also wanted to know why Litvinenko was not given the correct antidote in the hospital and why the radiation had not been correctly diagnosed for more than three weeks. They said that their repeated requests to speak to the doctors and see their notes were "denied" and that none of the material they received in the "joint investigation" even "touched upon the issue of the change in Litvinenko's diagnosis from Thallium poisoning to Polonium poisoning." They added, "We have no trustworthy data on the cause of death of Litvinenko since the British authorities have refused to provide the necessary documents." The only document provided in the British file indicating that a crime had been committed is an affidavit by Rosemary Fernandez, a Crown Prosecutor, stating that the extradition request is "in accordance with the criminal law of England and Wales, as well as with the European Convention on Extradition 1957." The British police summarized their case against Mr. Lugovoi in a report that accompanied the extradition papers. But instead of citing any conventional evidence, such as eyewitness accounts, surveillance videos of the Pine Bar, fingerprints on a poison container (or even the existence of a container), or Mr. Lugovoi's possible motive, the report was almost entirely based on a "trail" of Polonium-210 radiation that had been detected many weeks after they had been in contact with the Polonium-210. From the list of the sites supplied to the Russian investigators, it is clear that a number of them coincide with Mr. Lugovoi's movements in October and November 2006, but the direction is less certain. When Mr. Lugovoi flew from Moscow to London on October 15 on Transaero Airlines, no radiation traces were found on his plane. It was only after he had met with Litvinenko at Erinys International on October 16 that traces were found on the British Airways planes on which he later flew, suggesting to the Russian investigators that the trail began in London and then went to Moscow. They also found that in London the trail was inexplicably erratic, with traces that were found, as they noted, "in a place where a person stayed for a few minutes, but were absent in the place where he was staying for several hours, although these events follow one after another." When the Russian investigators asked the British for a comprehensive list of all the sites tested, the British refused, saying it was not "in the interest of their investigation." This refusal led the Russian investigators to suspect that the British might be truncating the trail to "fit their case." Despite its erratic nature, the radioactive trail clearly involved the Millennium Hotel. Traces were found both in rooms in which Mr. Lugovoi and his family stayed between October 31 and November 2, and the hotel's Pine Bar, where Litvinenko met Messrs. Lugovoi and Kovtun in the early evening of November 1. If Litvinenko's tea was indeed poisoned at that Pine Bar meeting, as the British contended, Mr. Lugovoi could be placed at the crime scene. But other than the radiation, the report cited no witnesses, video surveillance tapes, or other evidence that showed that the poisoning had occurred at the Pine Bar. It could just as well have occurred early in the day at other sites that also tested positive for radiation. Litvinenko, who was probably the best witness to that day's events, initially said he believed that he had been poisoned at his lunch with Mr. Scaramella at the Itsu restaurant. Even one week after he had been in the hospital, he gave a bedside BBC radio interview in which he still pointed to that meeting, saying Mr. Scaramella "gave me some papers.... after several hours I felt sick with symptoms of poisoning." At no time did he even mention his later meeting at the Pine Bar with Mr. Lugovoi. Not only did the Itsu have traces of Polonium-210, but Mr. Scaramella was contaminated. Since Mr. Scaramella had just arrived from Italy and had not met with either Mr. Lugovoi or Mr. Kovtun, Litvinenko was the only one among those people known to be exposed to Polonium-210 who could have contaminated him. Which means that Litvinenko had been tainted by the Polonium-210 before he met Mr. Lugovoi as the Pine Bar. Litvinenko certainly could have been contaminated well before his meeting with Mr. Scaramella. Several nights earlier, he had gone to the Hey Joey club in Mayfair. According to its manager, Litvinenko was seated in the VIP lap-dancing cubicle that later tested positive for Polonium-210. The most impressive piece of evidence involves the relatively high level of Polonium-210 in Mr. Lugovoi's room at the Millennium Hotel. Although the police report does not divulge the actual level itself (or any other radiation levels), Detective Inspector Lock states that an expert witness called "Scientist A" found that these hotel traces "were at such a high level as to establish a link with the original Polonium source material." Since no container for the Polonium-210 was ever found, "Scientist A" presumably is basing his opinion on a comparison of the radiation level in Mr. Lugovoi's room and other sites, such as Litvinenko's home or airplane seats. Such evidence would only be meaningful if the different sites had been pristine when the measurements were taken. However, all the sites, including the Millennium hotel rooms, had been compromised by weeks of usage and cleaning. So the differences in the radiation levels could have resulted from extraneous factors, such as vacuuming, or heating conditions. The Russian investigators also found these levels had little evidentiary value because the British had provided "no reliable information regarding who else visited the hotel room in the interval between when Lugovoi departed and when the traces of polonium 210 were discovered." As a result of this nearly month-long gap, they could not "rule out the possibility that the discovered traces could have originated through cross-contamination by outside parties." Hospital tests confirmed that Messrs. Lugovoi, Kovtun, and Scaramella and Litvinenko's widow, Marina, all had some contact with Polonium-210. But it is less clear who contaminated whom. The Russian investigators concluded that the all the radiation traces provided in the British report, including the "high level" cited by "Scientist A," could have emanated from a single event, such as a leak — by design or accident — at the October 16 meeting at the security company in Berezovsky's building. But they could not find "a single piece of evidence which would confirm the charge brought against A.K. Lugovoi." Britain may have had more incriminating evidence against Mr. Lugovoi than it chose to provide to Russia. It may not have wanted to share data that would reveal intelligence sources. But why would it refuse to share such basic evidence as the autopsy report, the medical findings, and radiation data? And if Britain wanted to extradite Mr. Lugovoi, why would it send such embarrassingly thin substantiation? Mr. Putin blamed British incompetence, saying, "If the people who have sent us this request did not know that the Russian Constitution prohibits extradition of Russian citizens to foreign countries, then, of course, this would make their level of competence questionable." But here he may have underestimated the British purpose in staging this gambit. Before the extradition dispute, Russian investigators, in theory, could have questioned relevant witnesses in London. Their proposed roster of witnesses suggested that Russian interest extended to the Russian expatriate community in Britain, or "Londongrad," as it is now called. The Litvinenko case provided the Russians with the opportunity for a fishing expedition, since Litvinenko had at the time of his death worked with many of Russia's enemies, including Mr. Berezovsky; his foundation head, Mr. Goldfarb, who dispensed money to a web of anti-Putin websites; his Chechen ally Akhmed Zakayev, who headed a commission investigating Russian war crimes in Chechnya (for which Litvinenko acted as an investigator), and former owners of the expropriated oil giant Yukos, who were battling in the courts to regain control of billions of dollars in its off-shore bank accounts. 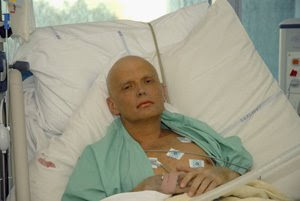 The Russian investigation could also have veered into Litvinenko's activities in the shadowy world of security consultants, including his dealings with the two security companies in Mr. Berezovsky's building, Erinys International and Titon International, and his involvement with Mr. Scaramella in an attempt to plant incriminating evidence on a suspected nuclear-component smuggler — a plot for which Mr. Scaramella was jailed after his phone conversations with Litvinenko were intercepted by the Italian national police. The Russians had asked for more information about radiation traces at the offices of these companies, and Mr. Lugovoi had said that at one of these companies, Erinys, he had been offered large sums of money to provide compromising information about Russian officials. Mr. Kovtun, who also attended that meeting, backs up Mr. Lugovoi's story. Such charges had the potential for embarrassing not only the security companies that had employed Litvinenko and employed former Scotland Yard and British intelligence officers, but the British government, since it had provided Litvinenko with a passport under the alias "Edwin Redwald Carter" to travel to parts of the former Soviet Union. The British extradition gambit ended the Russian investigation in Londongrad. It also discredited Mr. Lugovoi's account by naming him as a murder suspect. In terms of a public relations tactic, it resulted in a brilliant success by putting the blame on Russian stonewalling for the failure to solve the mystery. What it obscured is the elephant-in-the-room that haunts the case: the fact that a crucial component for building an early-stage nuke was smuggled into London in 2006. Was it brought in merely as a murder weapon or as part of a transaction on the international arms market? There is little, if any, possibility, that this question will be answered in the present stalemate. The Russian prosecutor-general has declared that the British case is baseless; Mr. Lugovoi, elected to the Russian Parliament in December 2007, now has immunity from prosecution, and Mr. Scaramella, under house arrest in Naples, has been silenced. The press, for its part, remains largely fixated on a revenge murder theory that corresponds more closely to the SMERSH villain in James Bond movies than to the reality of the case of the smuggled Polonium-210. After considering all the evidence, my hypothesis is that Litvinenko came in contact with a Polonium-210 smuggling operation and was, either wittingly or unwittingly, exposed to it. Litvinenko had been a person of interest to the intelligence services of many countries, including Britain's MI-6, Russia's FSB, America's CIA (which rejected his offer to defect in 2000), and Italy's SISMI, which was monitoring his phone conversations. His murky operations, whatever their purpose, involved his seeking contacts in one of the most lawless areas in the former Soviet Union, the Pankisi Gorge, which had become a center for arms smuggling. He had also dealt with people accused of everything from money laundering to trafficking in nuclear components. These activities may have brought him, or his associates, in contact with a sample of Polonium-210, which then, either by accident or by design, contaminated and killed him. To unlock the mystery, Britain must make available its secret evidence, including the autopsy report, the comprehensive list of places in which radiation was detected, and the surveillance reports of Litvinenko and his associates. If Britain considers it too sensitive for public release, it should be turned over to an international commission of inquiry. The stakes are too high here to leave unresolved the mystery of the smuggled Polonium-210.